Kultchaz is a group of nine musicians, created by Sylvain Ransy a pianist from Guadeloupe and the Tunisian guitarist Saber Gallali. These two jazz musicians gather in the same group a multitude of musical styles, cultures and influences. 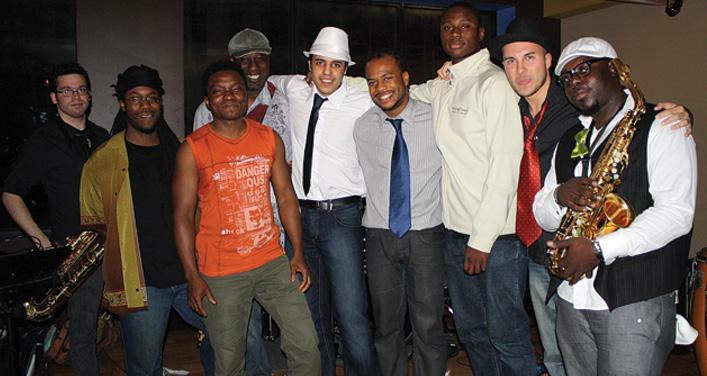 They are inspired by jazz, African, Arab, Caribbean and Latin musics. The name “Kultchaz” means cultures and it symbolizes diversity and openness. They play meanly brasses and percussions creating festive and rich rhythms music. Kultchaz offers a unique mixture of cultures, giving us an original and captivating show.